Two Luton taxi drivers have been fined for ‘blagging’ - picking up passengers illegally - in Milton Keynes. Faizan Ali of Townsley Close, Luton, pleaded guilty to plying for hire and driving without valid motor insurance in June 2017 when he attended Milton Keynes Magistrates Court on January 26. He was fined £120 for plying for hire and £120 for invalid insurance. He was also given 6 DVLA penalty points and has to pay costs of £631, with a victim surcharge of £30. Mr Ali said that he had not received any training on plying from hire from Speedline or Aylesbury Vale. he is licensed by Aylesbury Vale District Council and is operated by Speedline. Monzur Ahmed of Bosmore Road, Luton, pleaded guilty for plying for hire and driving without valid motor insurance in July 2017. He was fined £145 to plying for hire and £145 for invalid insurance. He was also given 6 DVLA penalty points and has to pay costs of £631, with a victim surcharge of £30. Mr Ahmed is licensed by South Northants District Council and is operated by Speedline. The men were caught after a joint enforcement operation carried out by Milton Keynes & South Northants Taxi Enforcement Teams and Thames Valley Police in June & July 2017. The court heard how officers, acting as members of the public, engaged the drivers on journeys which had not been pre-booked from one location to another in Milton Keynes. At the completion of these journeys taxi enforcement officers and police were waiting. Investigations by council officers showed that the vehicles were not lawfully pre-booked for these journeys. The vehicles were licensed by South Northants and Aylesbury Vale Councils and were displaying door signs of Private Hire Operator Speedline. Cllr Catriona Morris, chair of the MK Regulatory Committee, said: “The laws and licensing standards that we enforce are in place to ensure that passengers are safe. People should be aware that if they use private hire vehicles without booking in advance then the vehicle will not be insured if an accident occurs. 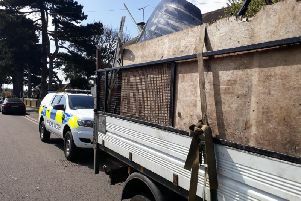 “Whilst it is unfortunate that the number of offenders is still too high I am pleased that our enforcement partners have supported us during this operation.